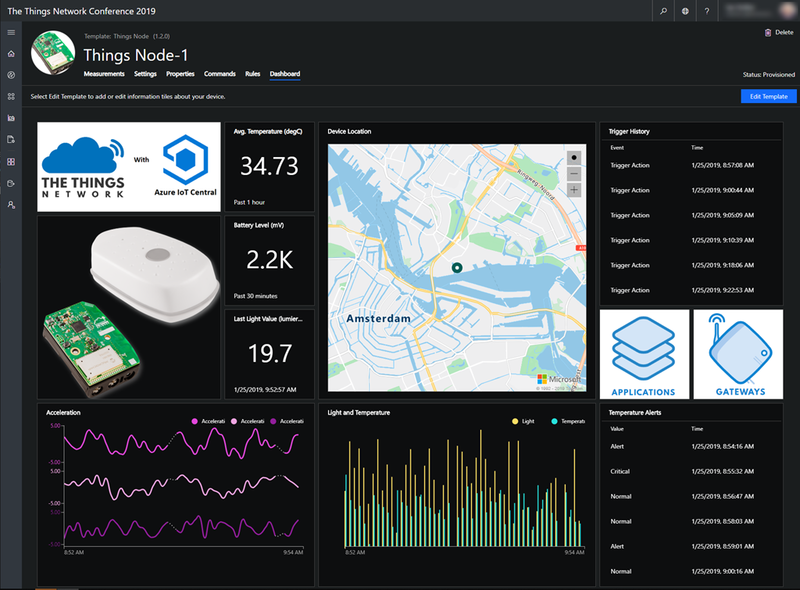 This week, at The Things Conference in Amsterdam, Microsoft and The Things Network Foundation collaborate with 2,000 LoRaWAN developers, innovators, and integrators on connecting devices to Azure IoT Central using the open source project Azure IoT Central Device Bridge. Internet of Things (IoT) applications are about harnessing sensors and device data to transform processes and businesses. They require pervasive connectivity to allow compute at the intelligent edge, connected devices and sensors, communicate and share learnings with the intelligent cloud. The heterogenous nature of IoT devices, networks, and infrastructures leads to the creation of different protocols and technologies for wirelessly connecting IoT devices, each addressing specific needs and requirements for battery consumption, range, security, frequency usage, and more. LoRaWAN™ is one of these technologies – a specification developed by the LoRa Alliance as a low power, wide area networking protocol based on a star-of-stars topology in which gateways relay messages between end-devices and a central network server. Many companies have adopted LoRaWAN and often offer IoT connectivity services, simplifying connectivity for IoT devices. The Things Network, an active member of the LoRa Alliance, is a Foundation that aims at building a global open LoRaWAN network and supporting developers in building industrial grade LoRaWAN solutions. They foster an active global community of over 60,000 developers and offer a marketplace of LoRaWAN compatible solutions, devices, and services. To bring the intelligence of Microsoft Azure to existing IoT cloud solutions, such as The Things Network, the Azure IoT team created the Azure IoT Central Device Bridge, an open source, ready to deploy project that leverages Azure services and makes it trivial to connect LoRaWAN devices to Microsoft’s SaaS offering for IoT. The combination of both solutions, integrated in a matter of minutes, allows you to ingest The Things Network devices and sensors’ data into Azure IoT Central to be displayed, analyzed, and trigger actions in business applications. The Things Conference brings 2,000 LoRaWAN developers, innovators, and integrators together and is the ideal playground to work with LoRaWAN experts on this simple and robust integration. We are eager to make the Azure IoT Central Device Bridge project grow with the help of the community and look forward to connecting the millions of LoRaWAN things to Azure IoT. If you are planning to or already developing LoRaWAN solutions, join the project today and contribute your code, comments, and suggestions!